This will be my weekly round up of all the movies I watched during the previous week, with a score out of ten plus a few comments if I feel so inclined. Fascinating fact: I intended to see The Lincoln Lawyer this week at the cinema, but was thwarted by the fact that none of my friends or acquaintances had much interest. I may have to wait for Matthew McConnaughey's long awaited 'second good performance' (after Dazed & Confused) when it comes out on DVD. Peter Bogdanovich's bleak tale of the trials and tribulations of growing up in rural Texas in the 1950s. I'd heard that this film was one of the best movies of the new wave of Hollywood cinema in the 70s, but for one reason or another, never got round to seeing it. While I wouldn't rate it as highly as say 'The Godfather' or 'Chinatown', I'm glad I saw it. I was particularly impressed with Timothy Bottoms as Sonny, who is the focus of the movie, but there are also strong performances from a very young (I didn't recognise him) Jeff Bridges as Duane, Sonny's best friend, Ben Johnson as 'Sam the Lion' (owner of the Picture Show of the title) and Ellen Burstyn. The plot moves at a rather leisurely pace, following the lives of a group of teenagers in a dusty, inhospitable town which is too hot for comfort in the summer, and where tumbleweed blows through the streets on windy winter days. As friends and co-captains of the local high school's awful football team, Sonny and Duane start the movie happy with their lot in life, but are driven apart by the beautiful but manipulative Jacy Farrow (Cybill Shepherd). Sonny's struggles are echoed by the death of the small town itself; after the death of local benefactor Sam the Lion, the town's cinema and pool hall close, leaving the town devoid of anything to interest its residents. The movie is beautifully shot in black and white, and Bogdanovich expertly recreates small town life in the 50s. I think in many ways, the easiest films to assess are horror movies and comedies - ultimately, whether the film is successful or not boils down to a single question - was I scared, or was I amused? 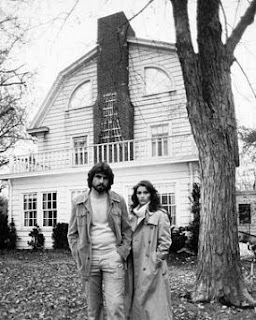 Unfortunately for the original Amityville Horror, I can't recall being frightened in the slightest, and I say that as a person who is routinely terrified by fairly tame horror films. The plot involves a family moving into a house with a terrible past; the opening scene of the movie shows a former resident of the Long Island residence in question shooting the other members of his family. Into this delightful abode comes Margot Kidder, with her three kids - a pair of twins who barely feature in the movie, and youngest daughter Amy, who makes a new, invisible friend named 'Jody'. Stepfather James Brolin has married into this family unit, and is the person who is most affected by the evil aura (or whatever it's supposed to be) that is emitting from the basement in the house. Brolin starts off the movie looking like Grizzly Adams, but increasingly resembles Charles Manson as the film progresses. The appearance of the house from the outside is possibly the best thing about the film, with the two upstairs windows glowing like eyes in a menacing face. Unfortunately for a film based on special effects to show off he supernatural forces at work, most of the effects are pretty laughable - I suppose the flies which torment the priest who has come to bless the house have something of a gross out factor working for them, but the eyes which appear outside the window and the bleeding walls look a little ridiculous. The film's climax is possibly the weakest segment, with Brolin/ Manson venturing into the haunted cellar to save the family dog, and rather than being devoured by demonic forces, merely gets a bit dirty when he encounters the black tarry devil slop which lies beneath the basement. Compared with similarly themed horror films from the era, such as The Shining and The Exorcist, Amityville comes up well short. I've been a huge Edgar Wright fan since Spaced, so when Scott Pilgrim came out last summer I was really looking forward to seeing it, despite some pretty lukewarm reviews from the critics. In the cinema it really worked for me - I loved the classic video game references, most of the jokes hit their mark and the action sequences were suitably over the top. However, I wasn't quite so keen on it second time around. Don't get me wrong, I still enjoyed the movie, but I just didn't find it as amusing this time, and I suppose the splashy special effects using during the battle sequences just work better on the big screen. 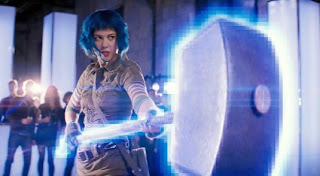 Michael Cera deploys his usual George Michaelesque persona as Scott Pilgrim, a nebbishy bassist in a Toronto garage band aiming to win a battle of the bands competition at the same time as Scott is seeking to win the heart of the violently coiffed Ramona Flowers (Mary Elizabeth Winstead). Unfortunately for the eponymous Mr Pilgrim, he first has to battle Ramona's seven evil exes in a series of battles based on classic video games. Probably my favourite scene involved Chris Evans as obnoxious film star/ skater Lucas Lee. As Lucas says on receipt of a text message "that's actually hilarious". I'd agree with Lucas as far as Scott Pilgrim vs. the World goes. For the most part anyway. As with Scott Pilgrim, I really enjoyed this movie when I first caught it in the cinema last year, and this time, I liked it even better on second viewing. Make that Jesse Eisenberg 1 Michael Cera 0. The film tells the astonishing story of Facebook founder Mark Zuckerberg, and shows how he went from designing a website comparing co-eds at Harvard to running one of the world's biggest companies in under a decade. On the face of it, the founding of Facebook doesn't sound like it would make for a particularly compelling movie but instead of showing Zuckerberg and co spending hours in a darkened room coding away, it looks into the boardroom intrigue and backstabbing that went on behind the scenes. As the movie poster famously said, you don't get to 500 million friends without making a few enemies. In this case, Zuckerberg steps over both his (former) best friend, Eduardo Saverin and two campus jocks (the Winklevoss twins) to get to the top, and both bring multimillion dollar lawsuits against him. 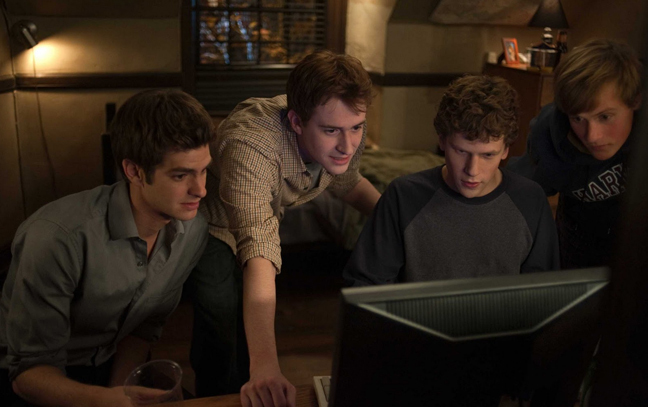 Jesse Eisenberg is terrific as Zuckerberg, a man whose intelligence, creativity and ambition are counterbalanced by a lack of tact and social skills. Andrew Garfield (as Saverin) and Justin Timberlake (as Sean Parker, the founder of Napster) both lend strong support. In which a group of Chicago high schoolers learn a few life lessons during Saturday detention. I hadn't watched The Breakfast Club for a long time, and was wondering how it would hold up now that I'm that many more years removed from adolescence. On the whole, it's still a fun movie, but it works better as a comedy than as some sort of manifesto for how teenagers should treat one another. 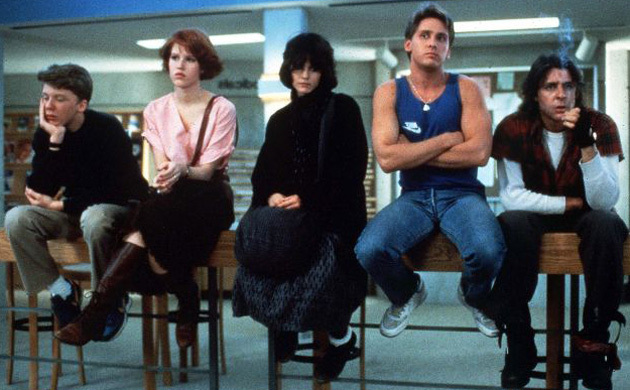 I enjoyed the funny moments far more than the occasions where John Hughes tried to teach me some kind of profound lesson about how we're all the same on the inside, man. Still, the fashions and dance moves of the 80s are always amusing to look back on. Can the athlete, the princess, the brain, the criminal and the basket case remain friends after their weekend of personal epiphanies? What kind of makeover makes you look far less attractive at the end of it? Why does Judd Nelson need to wear so many coats at the same time?